I felt the scrappy pull again last weekend and wanted to create a page. I had some photos that I took of my dear friend SarahBeth's daughter Evangeline at her birthday party and thought it would be fun to make a girly layout for once. Here is the full layout, inspired by this one by Eva Pizarro that I found on Pinterest. (SarahBeth is ok with me posting photos of Evangeline as long as I watermark them). I love the original layout that uses (what I think is) 3x4 spots and a single photo. Each 3x4 space is decorated differently and I really adore that look. 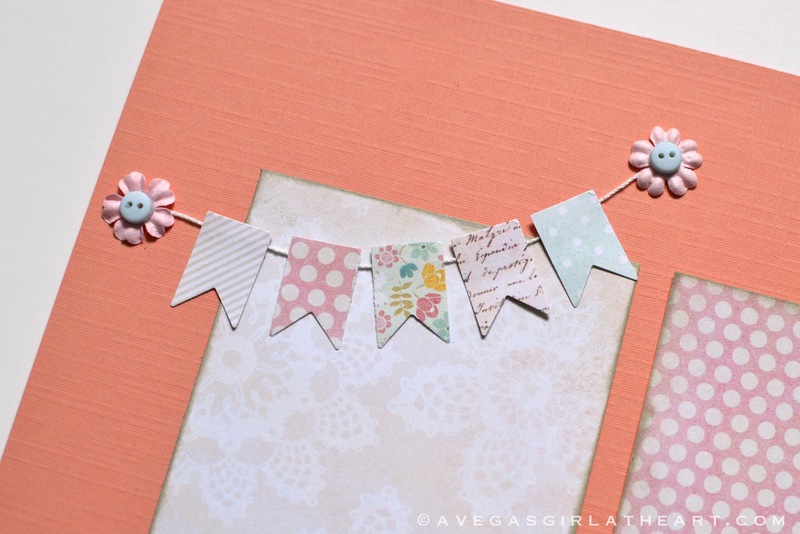 I used paper from My Mind's Eye as the base of my layout design and added embellishments that coordinated from my stash. I absolutely LOVED the doily sheet in this paper stack. Evangeline turned 3, and I used some My Mind's Eye stickers and American Crafts thickers for this 3x4 spot as the title of my page. 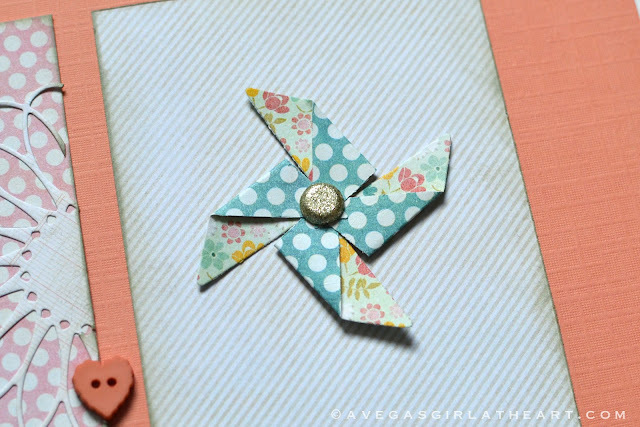 I made this pinwheel using the Stampin' Up! Pinwheel Sizzlit die (this was from the Spring catalog and I think it has been retired) and some of the My Mind's Eye paper. I added a sparkly brad to the center. A banner I made by punching pennants with the Epiphany Crafts pennant punch. I added some white twine to the back of the flags and then tiny paper flowers with teeny tiny button centers to "hold" the banner. 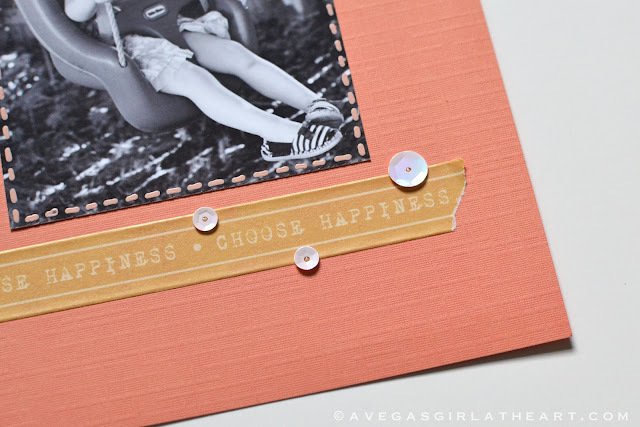 Typewriter onto some scraps from the MME stack, then die cut using a Stampin' Up! framelit and cut in half. Finally added some doodle stitching to the photo using a Sakura Souffle pen and some washi tape from Glitz. I added a few sequins in random spots on the page too. So love this layout! Who says you have to scrap only your own children? this is gorgeous!!! love the colors and papers you chose! Thank you! Far cry from those old Creative Memories layouts, eh? 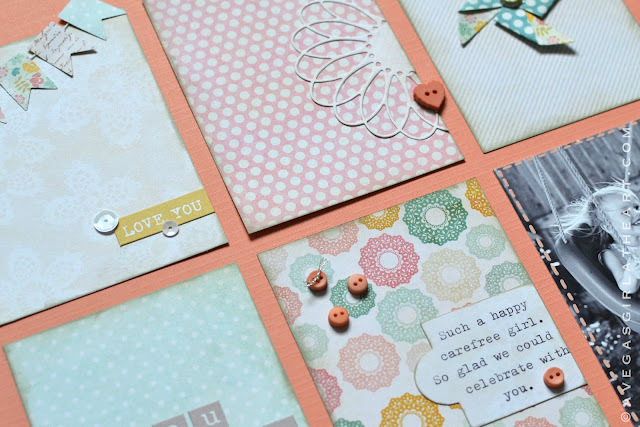 Very clever use of the 3x4 cards on a traditional page! I feel a scrap lift coming on! Gorgeous layout, I absolutely love it!! What a lovely and sweet layout!